A good park signage system performs multiple functions: it provides effective information and direction for people to find their way around the park; encourages learning experiences; helps maintain the image of the park; and communicates park rules. 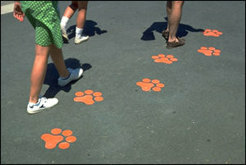 Signing can meet specific needs, target certain areas, and at the same time be kept to a minimum in the park as a whole. It can also provide a sense of place and local pride through incorporating the history of a specific site in the overall design. In an effort to aid non-graphic design professionals who are developing and designing park signage, we have drawn from the work and experience of Project for Public Spaces, Inc. and from graphic designers Lebowitz & Gould Design, Inc. and Lance Wyman Design, Ltd. Clarify your goals. Decide the goals and purposes for the signage system you want to develop. Determine what you want the signage to do, who it is to serve, and the kind of information you want to communicate. Survey the existing signage conditions in the park. Build upon what already exists by using what works well and improving on that which does not. Using existing elements or variations upon those elements can build users' familiarity with signs and their meanings. 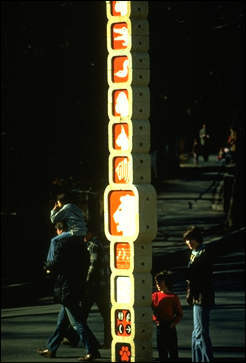 A survey of the existing signage may include: reviewing existing standards and guidelines; evaluation studies; interviewing park staff concerning information relevant to the park and region; surveying existing signage, its types, condition and relation to local topography and conditions; and examining incident and accident records to determine what special signing needs may be relevant to develop. Understand issues, problem areas and perceived decision points along park visitor's paths into and through the park. Talk to people about areas or facilities they find difficult to locate, about park image, and difficulties they have in using the park. Make observations of different types of visitors (e.g. the elderly, children, families, handicapped, etc.) in order to "see" the way other people make decisions and how they enter and move through the park. Consider the needs of special groups such as those who are at stroller height as well as those who travel through the park by bicycle. Interview park staff about information related problems that they have noticed, including staff-visitor conflicts (such as activities that visitors like to engage in that may conflict with park maintenance or goals), conflicts between types of visitors, vandalism, recurring problems and questions, sponsored programs and activities; and park staff information needs. 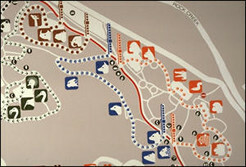 Circle these areas on a map of the park. Identify unique aspects of the history of the site. Consider and identify unique aspects of the history of the park and surrounding area that contribute to a sense of place, nurture local pride and stimulate learning about the place. Outline general program guidelines for the overall information system. Make use of the information you have gathered to decide on signage goals, determine who your visitor audiences are, and consider the tone of the message you want to set. It is helpful to do this both in writing and in a plan of the park. Develop a master plan for the overall informational system that includes signs that are informational, directional or that help people orient themselves, and possibly signs that identify particular park places. The master plan lays out the types of signage needed, the text and symbols for the signs incorporating the guidelines and information you have collected. Using the plan you have developed and the written issues, organize and prioritize information requirements into groups of signage by type. Develop text and symbols for the new signs and revise messages for the existing signs where necessary. 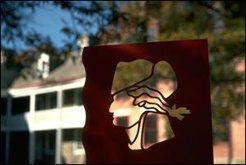 Consider ways in which the history of the site can be incorporated into the signage text and symbols. Include messages for special user groups such as the physically handicapped, among others. Develop lists of messages for all sign types, such as: directional, informational (regulatory and interpretive) and identifying signs. Test, experiment, and evaluate the effect of the signs you have developed. Do brief tests of the sign types you have developed to see if they are effective. Experiment with how the messages are phased, how the signs are designed, and where the signs are located as a way to determine more effective signage. Evaluate the effectiveness of the signage according to the goals and purposes that you developed and the general program guidelines and goals you set during your signage development by talking to visitors about their experiences with the signage as well as how the messages are phrased, designed, and located. 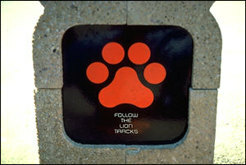 The location of park signage is an important consideration in communicating the message. 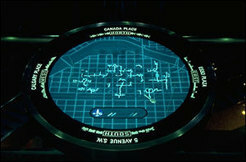 Maps, kiosks, and other elements, in addition to conventional signage, also function as signs. Placing signage in conjunction with other park amenities such as benches, cafes, restrooms, and places where paths cross can create mini destinations or places in the park. This idea is called "triangulation" because the elements functioning together have a bigger impact than they would separately. Incorporating other activities and uses in the area of signage can provide visitors with the opportunity to attend to several needs at the same place as well as create a comfortable and social place for people to relax and spend time. In parks where there are large sections of natural areas or where there are no specific place destinations, small nodes or places can be created with a sign, a picnic table, and telephone or other amenity as a way to provide a location, for meeting or emergency purposes. Directional signs located within natural areas, as mentioned above, can help people keep their bearing as well as feel located and secure. Signs can also be placed in front of interesting or unusual flora, fauna, mountains, trees or other natural features as a way to encourage visitor interaction and engagement with their surroundings. Often park visitors are familiar with the one or more sections of a park that they frequent and are not familiar with the breadth of a park and its facilities. In addition, visitors are often uninformed about tournaments, park events and activities, and renovation or management plans. Enclosed information/bulletin boards can serve as an outreach tool to better inform visitors about the park. Educational Signs Educational signs such as those that highlight or point out specific trees,paths, flowers, or other elements of the natural environment can also be conceived as a fun way to engage people in interacting with the natural environment. The trail side museum at Harriman State Park in Rockland County, New York makes use of this type of signage particularly well. Directional Signs Directional signs posted intermittently, especially in natural areas, not only can serve to help people keep their bearing, but also feel located and secure.